What follows is a translation of Alexandre Kojève’s account of Alexandre Koyré’s doctoral defense on March 1st, 1929. As you’ll see from the text below, Husserl was in attendance for Koyre’s defense. The event took place between Husserl’s Paris and Strasbourg lectures. 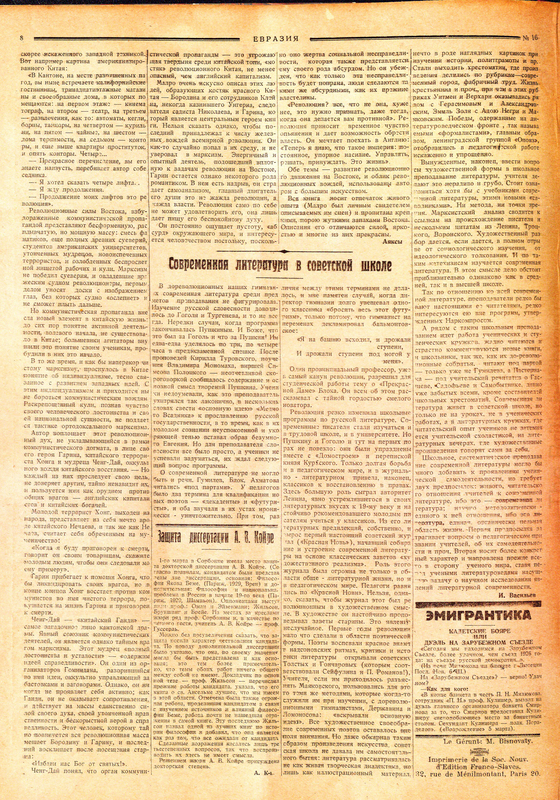 A copy of the original Russian text is attached. The defence of Koyré’s thesis took place on the 1st of March in Sorbonne. As per the stated university rules, two theses were presented, the primary, entitled The Philosophy of Jakob Böhme (1929. Paris: Vrin) and the supplementary, Philosophy and the National problem in Russia at the beginning of the 19th century (1929. Paris: Champion). Koyré’s opponents for each thesis were, respectively, MM. [???] Oman and [Louis] Eisenmann for the supplementary, and MM. [Étienne] Gilson, [Léon] Brunschvicg and [Émile] Brehier for the primary. A number of Sorbonne professors were also in attendance, as was [Edmund] Husserl, Koyré’s teacher, who was invited to sit among them as an honorary guest. It must be stated that such was the candidate’s reputation that this was less of a defence but more of a celebration in his honour. The supplementary thesis was held to be of such quality that it could have been submitted as a primary thesis in its own right. This was particularly remarkable considering that neither works were greatly overlapping and as such were a testament to the candidate’s worth. Gilson, who had also considered the primary thesis, went through and described the candidate’s previous works, stating that his monograph on Anselm of Canterbury was the best in the field. Likewise, Gilson noted the huge amount of work that the candidate performed in exploring and understanding the sources and influences of Böhme, work that had not actually been reflected in the thesis itself. He concluded stating that this thesis was one of the greatest books on the history of philosophy and was exactly what everyone had expected from the candidate. As any critical comments were only of superficial concern with regards to the text, it is not necessary to restate them at this stage. The defence concluded when the jury conferred on Koyré the degree of Doctor.